Google takes a very different approach to developing its mobile OS than Apple. The company’s “open” philosophy has given Android a lot of momentum in such a short period of time. Google Android’s market-share has been rising for quite some time now. But according to the most recent study by Nielsen, Android, iOS, and Blackberry may have reached a 3 way stalemate in this market. 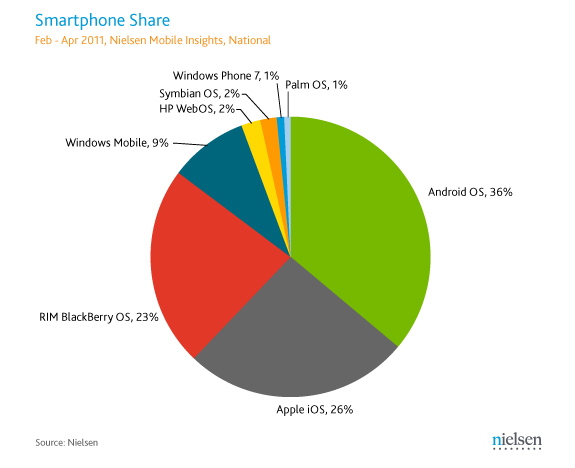 Android’s share has been around 36% from February to April 2011. Apple iOS’ marketshare has been around 26% for quite some time too. The same study shows that Apple iPhone owners are more likely to download applications, which is completely expected. At the same time, Android phone owners consumed 90M more than iPhone owners on average each month. HP Web OS and Windows Phone 7 are way behind these two in data consumption. We believe AAPL could enter the smartphone mid-market with a $300 iPhone with margins around the current corporate average. Our checks increasingly point to a launch within the next 6-18 months. We believe that this will increase Apple�s total addressable market by an additional 500 million phones per year. iPhone will be coming to more carriers in the near future. iOS will continue to hold a major chunk of the pie in the smart-phone OS market. Will it catch Android anytime soon? That remains to be seen. Verizon Android Share Down: iOS at Fault? iPhone 4: The Most Reliable Phone? 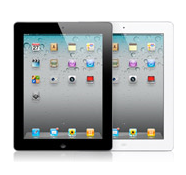 Apple Stock Downgraded, Troubles Ahead?